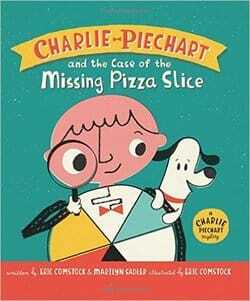 With a dinnertime mystery and 5 hungry suspects, Charlie Piechart makes fractions fun. Charlie Piechart has a piechart for a belly, and it’s a belly that’s perfect for showing fractions. In his first mystery, perfect for little math enthusiasts, it’s pizza night at the Piecharts’ house. How about veggies on top? “NO VEGGIES!” yell 4/6 of the pizza eaters. No one wants anchovies, either. They like Charlie’s idea best: pepperoni. But with 6 pizza eaters, 3 sizes of pizza on the delivery menu, and 2 slices allotted for each person, it is no surprise when there’s a mystery! A scream from Charlie’s sisters reveals the issue: 1 out of 12 slices has gone missing. So who did it? Charlie counts the suspects and questions each one (except Mom!). But could he be forgetting someone?